A TIRELESS worker in the Brighton community, Kath Burns died last month. 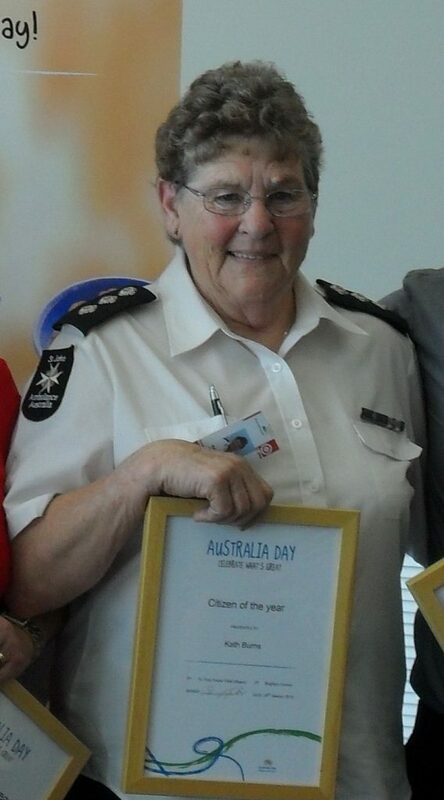 Kath was a member of St John Ambulance for almost 44 years, having joined the organisation in 1973. During her time with St John, Kath made an enormous contribution to her local community and the broader St John organisation through a unique level of voluntary service and was, without doubt, an outstanding role model for all members of the St John family. Kath Burns, a tireless worker for her community. She held numerous positions within St John over many years and also served with equal commitment and dedication in a variety of community groups, committees and various clubs. Prior to her service with St John, during the 1960s, Kath became a member of the then Civil Defence Team for Stonor (which was later absorbed into the State Emergency Service). This marked the start of a period of long and dedicated service to the various communities in which she subsequently lived. As a member of the Civil Defence Team, Kath completed numerous qualifications, including her first aid certificate. It was readily apparent, even at that early stage, that Kath was very enthusiastic about her first aid training and in 1973, she joined the Claremont Division of St John Ambulance. With St John, her obvious passion for first aid grew. Her commitment and expertise in first aid was evidenced by her winning the State Open First Aid Competitions in both 1979 and 1981. Significantly, Kath attributed her early work with St John as being a prime motivator for returning to study where, as an adult, she went on to undertake training as a nurse. She completed her nursing training in 1982 and continued working as a nurse for a further twelve years before eventually retiring. But clearly, Kath was not someone who was going to rest on her laurels and in 1985, along with her husband David, she helped establish the Brighton Division of St John Ambulance. During her time with the Brighton Division, Kath participated in numerous officer’s courses and as a consequence, was appointed to the position of State Officer of Cadets in 1998. She subsequently represented St John in competitions at both the state and national level, and held the positions of Brighton cadet and adult divisional superintendent. And if that wasn’t enough, she was both a divisional and commercial trainer. St John was clearly in Kath’s blood and this was evidenced by the fact she was also a first responder and covered numerous public events with her members. Not only was Kath a role model for others in St John, she took it upon herself to actively support the fund-raising activities of her beloved Division and for over 29 years, she was a keystone in the conduct of bingo nights, every Friday. This generated much-needed funds for the Brighton Division and assisted greatly in the purchase of member uniforms, essential equipment, stores and vehicles – which included the well-known Brighton bus which was used to transport Cadets to State Camps and other events. Throughout her time with St John, Kath dedicated literally thousands of hours of selfless and voluntary service. To say that she touched the lives of hundreds of people in her community would indeed be an understatement. Her efforts were well rewarded as the St John Brighton Division was always well run, in a sound financial position and was a respected and essential element of the local community. In recognition of her service, Kath was admitted as to The Most Venerable Order of the Hospital of St John of Jerusalem in 1984. For her continued service and dedication, she was subsequently promoted to the Grade of Officer in 1997 and appointed as a Commander within the Order in 2010. In addition to Kath’s service with St John, she was an active supporter of a range of other community service organisations. Notably, she made a significant contribution to the first Dual Online Access Centre in her area and served as the Chair of the Access Centre Steering Committee when it first opened. Kath also served on many school committees including those at Brighton Primary, Bridgewater Primary and Bridgewater High Schools. In this regard, she was instrumental in ensuring her community was a better place for everyone and was a role model for others so far as community support and participation, and the vital role that women play in leading on issues. We can all learn from Kath’s achievements and particularly, from the lifetime of service and commitment that she gave to St John.